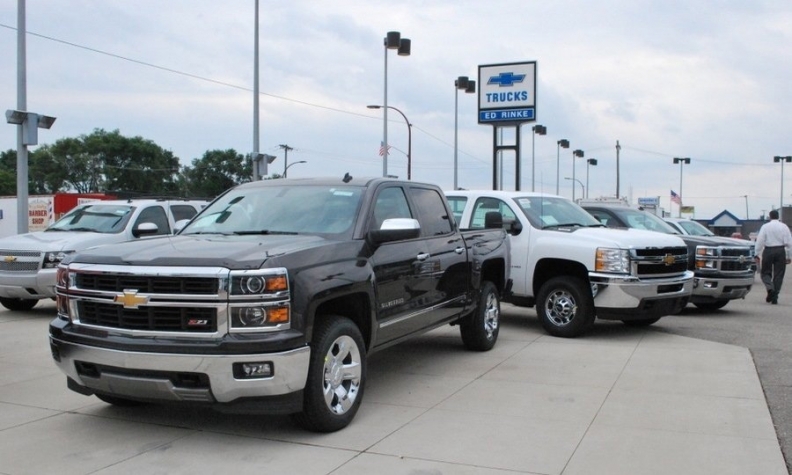 Sales of GM's full-sized pickups soared 44 percent to more than 60,000 in July, with the redesigned 2014 Chevrolet Silverado and GMC Sierra representing 15 percent of the total, the company said. U.S. light-vehicle sales -- driven by double-digit gains at six of the seven biggest automakers -- rose 14 percent in July, just below forecasts but strong enough to keep the industry's recovery on solid ground. Honda Motor Co., Toyota Motor Corp. and General Motors posted gains of 16 percent or more in July, outpacing rivals Ford Motor Co., Chrysler Group and Nissan Motor Co., each with an 11 percent increase. Subaru led everyone with a 43 percent advance in a month in which no automaker declined. The annualized industry sales rate, adjusted for seasonal trends and a broad sign of the industry's overall health, came in slightly below analysts' expectations at 15.67 million. It was the second-highest since late 2007, behind only June's 15.98 million rate. A year earlier, the light-vehicle SAAR totaled 14.2 million -- one of the weakest rates of 2012. That helped most automakers enjoy favorable comparisons this year. Beginning with November 2012, the SAAR has topped 15 million units every month except April. And the pace of sales in July is expected to keep the U.S. market on track to post its best year since 16.1 million light vehicles were sold in 2007. "Solid industry sales in July point to a stable market indicating a recovering economy," Bill Fay, Toyota division group vice president and general manager, said in a statement. U.S. light-vehicle sales have jumped 8 percent this year through July and are forecast to finish the year at around 15.5 million units. That would mark about a 50 percent increase from the industry total of just four years ago. Sales last month rose 21 percent at American Honda, 17 percent at Toyota Motor Sales and 16 percent at GM. Toyota Motor Sales, with volume of 193,394 units, outsold Ford -- by 314 units -- for the first time since March 2010. American Honda topped Chrysler Group by 1,337 cars and light trucks. American Honda said volume rose 21 percent at the Honda division, with the brand's 4 core models -- Accord, Civic, Odyssey and CR-V -- each generating double-digit gains. The Accord and Civic each tallied July volume in excess of 30,000 units. Sales advanced 18 percent at the Acura division. GM, Ford and Chrysler continue to benefit from surging demand for large pickups as the housing, construction and energy markets expand. With the increase in large truck volume outpacing the industry's overall sales pace, the Detroit 3 have gained U.S. market share this year. Sales of GM's full-sized pickups soared 44 percent to more than 60,000, with the redesigned 2014 Chevrolet Silverado and GMC Sierra representing 15 percent of the total, the company said. GM's car deliveries jumped 24 percent. GM's four brands each produced double-digit sales advances, led by an increase of 17 percent at Cadillac and Chevrolet. It was the biggest gain for Chevrolet -- GM's volume brand -- since March 2012. Kurt McNeil, head of U.S. sales operations, said it was the "most well-balanced month of the year from a retail sales standpoint" for GM. "The difference between good sales and great sales in a slow-growth economy is how many new products you have to offer, and we are starting to hit our sweet spot," McNeil said. At Ford, sales of small cars rose 32 percent in July to 27,131, while F-series pickup volume advanced 23 percent to 60,449 units. Ford brand deliveries increased 12 percent, while Lincoln volume slipped 1 percent. Retail sales rose 19 percent despite tight inventories of some car models, Ford said. Three Ford crossovers and SUVs -- Escape, Explorer and Edge -- generated July gains of 4 percent to 15 percent last month. Nissan said its July deliveries were paced by a 17 percent increase at the Nissan brand, offsetting a 33 percent drop at Infiniti. Sales of the Nissan Altima climbed 11 percent to nearly 30,000 units, while Versa deliveries jumped 21 percent to more than 9,000. The results at Chrysler were spurred by fatter discounts and another strong month of car and Ram pickup deliveries. It was the 40th consecutive month Chrysler Group's U.S. deliveries have advanced. Chrysler said car sales rose 14 percent while light truck demand advanced 10 percent, with Ram pickup deliveries climbing 31 percent to more than 31,000 units. Among brands, sales rose 31 percent at Ram, 18 percent at Dodge, and 2 percent at Fiat and Jeep. Volume slipped 4 percent at the Chrysler brand. "We continue to see strong retail sales, particularly with our pickup trucks and SUVs," Reid Bigland, head of U.S. sales for Chrysler Group, said in a statement. Sales at Jeep -- Chrysler's No. 2 brand last year after Dodge -- have slipped 4 percent this year following the discontinuation of the Jeep Liberty in August 2012. The Liberty's replacement, the 2014 Jeep Cherokee, is not expected to be widely available until September or later. TrueCar and Edmunds.com estimated Chrysler Group's average incentives last month rose 8 percent to 10 percent from July 2012 and now top $3,000 per vehicle. Hyundai Motor America's U.S. sales rose 6 percent to a July record of 66,005 units, with demand for the Santa Fe rising 48 percent and Elantra volume advancing 29 percent, CEO John Krafcik tweeted today. Mazda's sales advanced 29 percent in July -- its biggest gain in 18 months -- on a 53 percent increase in light truck volume and a 18 percent advance in car deliveries. Record July sales of the Forester, Outback and Impreza pushed Subaru's U.S. sales up 43 percent to 35,994 -- enough to outsell the VW brand and keep Subaru on track to set another high mark for annual U.S. volume. "At our current pace, selling 400,000 vehicles in 2013 is certainly within reach," said Bill Cyphers, senior vice president of sales for Subaru of America. Volkswagen posted a 3 percent decrease in sales with steady demand for the Passat and Jetta failing to make up for a lack of new products and tougher competition in the small and mid-sized sedan segments. Jetta sales are down 2 percent for the year, with 94,684 units sold through July. Passat sales spiked 12 percent in July and are up 3 percent for the year, with 66,170 units sold. "We're coming off some pretty strong numbers," Mark McNabb, chief operating officer of Volkswagen of America, told reporters today, referring to the brand's double-digit gains over the past few years. "We knew it would be a year of consolidated growth." Perhaps the best news for VW was a sharp increase in the rate at which customers chose diesel, the German brand's hallmark. Nearly 30 percent of cars sold in July were equipped with TDI engines -- and in the Passat, that number was nearly 40 percent. At Audi, sales rose 12 percent, propelled by SUV demand. Sales of the mid-sized Q5 increased 52 percent over last year and sales of the large Q7 grew by 49 percent. Jaguar Land Rover -- benefiting from new and redesigned models -- posted a 31 percent increase in July sales, and has seen volume now rise 15 percent to 36,445 for the year. Last month, Jaguar deliveries rose 60 percent, reflecting sales of the new F-Type, while the revamped Range Rover and Evoque drove Land Rover to a 22 percent gain. Low interest rates, widespread credit, attractive lease deals, pent-up demand, new or redesigned models and a steady rebound in the U.S. economy and housing market are fueling sales. Many automakers also joined Chrysler in hiking incentives last month to clear inventories of 2013 models. Large pickup trucks, crossovers and compact cars drove July's sales gains. Light truck volume rose 16 percent and car deliveries advanced 12 percent last month. "The summer surge continues," Morgan Stanley analyst Adam Jonas said in a research note published Tuesday. "July started with relatively weak showroom traffic through the third week. However, momentum picked up since and we expect the month to finish strong driven by a much healthier consumer sentiment." Analysts were especially encouraged because retail sales -- those made to individual customers -- accounted for the bulk of industry volume. Edmunds estimated fleet deliveries represented 14 percent of industry volume in July -- the lowest level of the year so far. "Consumer confidence has a played a key role in the ongoing recovery and currently is at the highest levels seen since January 2008," said Alec Gutierrez, senior market analyst at Kelley Blue Book. "With modest improvements in unemployment and housing expected to continue through the rest of the year, confidence likely will follow suit, driving new-car demand along with it." Ladis Sanchez, fleet manager at Galpin Ford in North Hills, Calif., described July sales as "phenomenal." Sanchez said demand remained strong last month for the C-Max, Escape, Fusion, Focus, F-150, Edge, and Explorer, while Taurus and Flex sales were slower. "A lot of [our] clients just seem to be a lot more stable," Sanchez said. But it was a tougher month at Allen Samuels Chrysler Dodge Jeep Ram Chevrolet in Ennis, Texas, despite a big promotional push. "We had mail for every week and radio for every week and two big inserts for the newspapers," said Tim Fowler, general sales manager at the dealership. "We're going to track out an average month, but it was like every deal had to be fought out." Gabe Nelson, Adam Rubenfire, Ryan Beene and Isabella Shaya contributed to this report.